Product prices and availability are accurate as of 2019-04-20 03:45:24 UTC and are subject to change. Any price and availability information displayed on http://www.amazon.com/ at the time of purchase will apply to the purchase of this product. 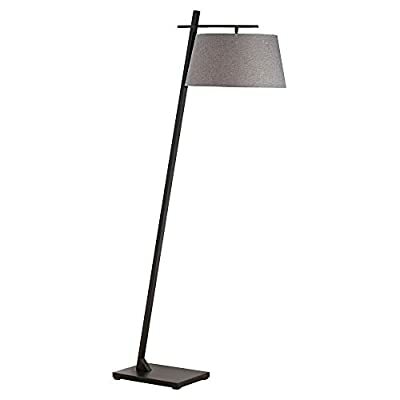 The angular Pacific Coast Lighting Axis 85-3030-07 Floor Lamp illuminates in high modern style. This floor lamp features a sleek black metal base and sophisticated dark gray linen empire shade with satin liner. It requires one 150-watt bulb, not included. Pacific Coast Lighting was founded in 1979. Since then they have set a standard of excellence for the entire lighting industry. They have built a reputation for innovative design, quality workmanship, and market responsiveness. Pacific Coast Lighting has its own house brand and is the lighting and accessory manufacturer for several of today's prestigious lifestyle brands. Kathy Ireland Home and National Geographic Home collections are two of these well-respected lines. Overall dimensions: 31W x 67.5H in.. Shade dimensions: 17.5 diam. x 9H in.. Black metal base. Round dark gray linen shade with satin liner. Rotary switch. Requires one 150-watt incandescent bulb (not included).